Shri Veeranarayana temple in Gadag is built by Hoysala King Vishnuvardhana. The temple is a mixture of Chalukya, Hoysala and Vijayanagara sculptures. The main entrance gate reminds us the Vijayanagara Art. Inside GarudaGamba and Rangamantap are in the manner of Hoysala sculpture. Temple is dedicated to Lord Vishnu/Veera Narayana.Inside the temple we can see many pillars and one of them is called Kumaravyasana Sthambha. 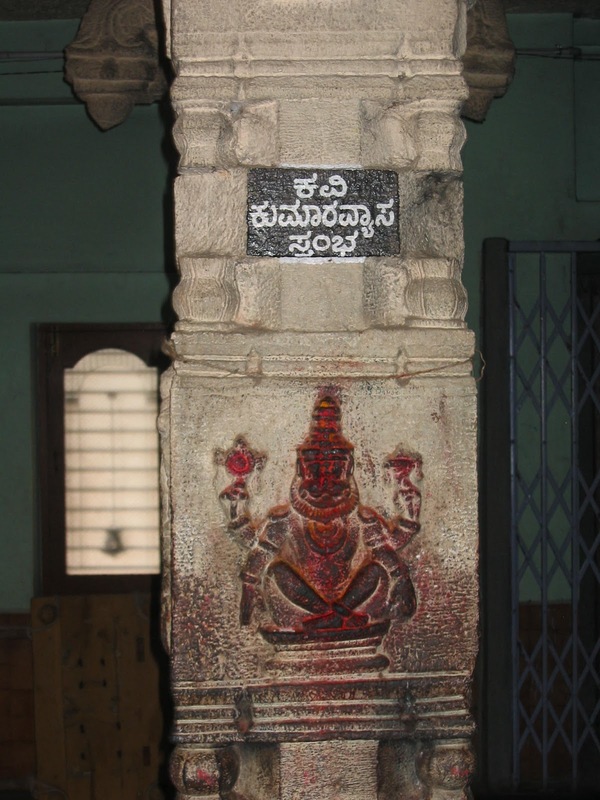 Its believed that Mahakavi Kumaravyasa wrote Karnataka Bharatha Katha Manjari (classic Mahabharatha in Kannada) sitting beneath this pillar. 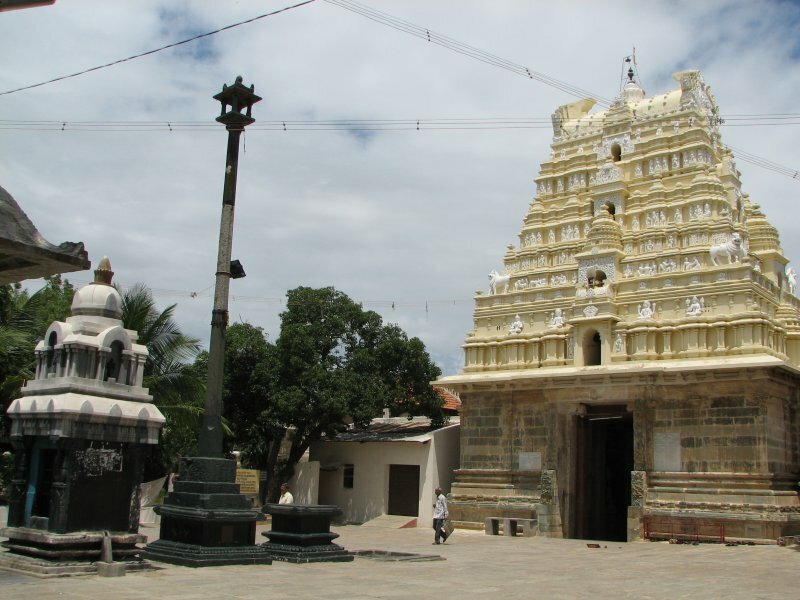 This temple is one among the 5 Narayana Temples in Karnataka established by King Vishnuvardhana. Gadag is situated in North Karnataka, 400 Kms from Bangalore and 60 Kms from Hubli. The Hoysala king Bittidevaraya after converting to Hinduism built this temple in 1117 A.D. This is one of the five Narayana temples that he built. The temple has reflections of Chalukya, Hoysala and Vijayanagara architecture. It has an entrance leading to the courtyard with the Garudasthambha and then the entrance in to the Rangamantapa / hall with pillars and then the Madhyaranga and finally the Garbhagriha / sanctum sanctorum. The idol of Lord Veeranarayana is in a standing pose and the dark blue shaded stone idol has a fantastic divine aura around it. The idol is decorated with Kireeta / Crown, Karnakundala, Shankha / conch, Chakra / disc, Gadha / Mace, Padma / Lotus. The lord is wearing the robe as a Veeragachche i.e, like a hero protecting his devotees. On the feet of the idol of Veeranarayana you can see a ball. It seems that Lord Narayana playing with a ball came down to this place from Badrinath. The ball stopped at Gadag and refused to move from that place. The lord stood there as an idol and he is known as Veeranarayana. One of the pillars in the Rangamantapa is known as Kumaravyasana Sthambha / pillar. The above stanza means that Vedavyasa himself is Lord Narayana. By the grace of Vedavyasa the Mahabharatha / Indian epic was written in Kannada in front of the divine grace by Gadugina Narayanappa. Gadugina Narayanappa is known by his byline Kumaravyasa and the Mahabharatha written by him is known as Karnataka Bharatha Katha Manjari, this version of the Mahabharatha is extremely popular in Karnataka and it is hailed as one of the finest works in Kannada. Kumaravyasa yearned to write the Mahabharatha in Kannada. He was searching for a guru to guide him through the process. One day he went to a place where there were thousands of people having food. He also sat down to have food; children who were sitting beside him started to fight. An elderly person nearby scolded the children by saying “Why are you fighting like Dhuryodhana?” Hearing this outburst a Brahmin who was sitting nearby had tears in his eyes and the Brahmin left the place without eating food. Immediately Narayanappa followed the Brahmin and greeted him and asked him who he was and also asked him why he was pained to hear Dhuryodhana’s name being attached to a fight. Narayanappa also told the Brahmin that he intended/desired to write the Mahabharatha in Kannada. Narayanappa was overwhelmed when the Brahmin tells him that he is none other than Ashwaththama himself. Ashwaththama told Kumaravyasa that he witnessed the Mahabharatha till the death of Duryodhana and he does not know what has happened after he left the battle field. He narrated the whole story of Mahabharatha to Kumaravyasa. This is the reason why only 10 parvas / sections were written by Kumaravyasa. Kumaravyasa used to dip in the holy tank of the temple and in wet clothes would stand leaning on the pillar in the Veeranaryana temple and narrate the Mahabharatha until his clothes dried. The confidence and clarity in which he narrated the Mahabharatha, it seemed that like Kumaravyasa was possessed by Lord Narayana himself. Gadag is around 500 km from Bangalore and 60 km from Hubli. Hubli is well connected with other cities through rail and road. There are many buses to gadag from Hubli, Dharwad and Hospet. Temple would be open in the morning and evening hours.